Back in 2013 I wrote an article which promoted the value and merit of school footy (see School Footy – the Aussie Rules Nursery). The article considered how important the school footy nursery was to club football. However, it also considered many of the challenges faced by schools and clubs in keeping numbers sustainable. Another factor considered was the devaluation of school footy inasmuch as some sectors did not recognise the value of school football adequately. Much has changed since 2013, and school football has risen to greater heights – at least in my experience. The increase in women’s and youth girl’s football has contributed to this. Our own Pyramid Power girls in Cairns have taken the link between school football and club football to an unusual, but potentially game-changing place. 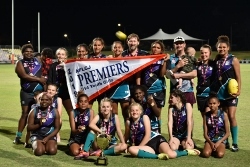 Last night, the Pyramid Power Under 14 Youth Girls team survived a big scare from their opposition, Cairns Hawks, to record an eight-point premiership victory. In a high quality game which rebounded from end to end like a tennis match, the Power girls clicked late in the third term to run over the Hawks at the right time. This description could be of any grand final anywhere – nothing particularly unique. However, dig a little deeper and there is a big backstory to the Power girl’s journey to last night’s success. As can often be the case, there is more to this Pyramid Power flag than meets the eye. Whilst the girls – Shaye, Talina, Ari, Summer, Tiffany, Emily, Sharmeria, T’Chiana, Rosie, Linda, India, Kathy, Dulcie, Katherine, Jacinta and Alicia (they deserve to see their names mentioned as they were wonderful) – won the game as a club team last night, the seeds can be traced back to 2015 when most of them were around ten years old. The core grew at Gordonvale State School in late 2015. By early 2016, the list had shrunk and new girls were recruited. They later played together at half-time in the Gold Coast Suns v Western Bulldogs clash at Cazalys Stadium in front of ten thousand AFL fans. They were hooked. Later in 2016, on a bus trip with the girls down to Mission Beach to play another embryonic school-based team, the suggestion was floated – whether this group of girls would consider coming on board ( lock, stock and smoking barrels) as a club team in the AFL Cairns competition. Last year, the girls played as Pyramid Power’s inaugural Under 14 Girl’s team. They finished third, with most of the girls still around 12 years old and much smaller than their opposition. However, this year, no such disadvantage. A stronger, wiser, more experienced outfit came together with some additions from outside that core group to win a premiership. From a school team to a champion club team with a premiership in only a couple of years. I don’t imagine for a moment this situation is unique. I am sure other school teams have treaded similar paths. However, I cannot imagine it is the norm either. The bold experiment by Pyramid Power to supplant a school team into a club-based league was out of the ordinary, yet has reaped a premiership in just a couple of years. Maybe it is a domain easier to work within, as girls footy grows new and exciting markets. Boys footy, grown over a longer period, has a more “traditional” pathway – following Dad, peer choices, heroes on TV. Nevertheless, a group of girls moving en masse from a school scene to a club scene should have clubs everywhere contacting their local schools to see what talent is there. No footy market can be guaranteed nowadays. Clubs that are too arrogant or detached to realise that talent pathways might be just around the corner or down the road could miss out on tapping into some serious talent. But, if a plan can be hatched in a bus on a highway in beautiful Tropical North Queensland and lead to a premiership two years later, then surely it is a concept worth exploring by other clubs everywhere. Personally, I would love to hear of other similar examples and maybe those, coupled with the Pyramid Power success, can enrich youth girl’s footy and maybe beyond. I don’t believe that anyone involved with Australian footy can remain complacent and assume the talent will come to them automatically. Sometimes you have to be imaginative, bold and a little “out there” to find and grow new markets for the game. The Power girls are now living proof of that.